Ashley Chadbourne McKinley (June 23, 1896 in Marshall, Texas – February 11, 1970) was an accomplished American aerial photographer and colonel in the U.S. Army Air Corps who helped pioneer aviation at subzero temperatures. He accompanied Richard E. Byrd as an aerial photographer on his expedition to the South Pole. McKinley joined Battery A of the Missouri National Guard on June 21, 1916 and served on the Mexican Border until December 21 of the same year. Following the United States' entry into the First World War, he enlisted in the United States Army Signal Corps on August 7, 1917 and became a dirigible pilot. He was commissioned as a 1st lieutenant in the Officer's Reserve Corps on December 7, 1917 to date from November 27. He was placed on active duty on December 16, 1917. During World War I, he commanded a balloon observation company. He later taught aerial photography and surveying. He was promoted to the rank of captain on November 20, 1918, shortly after the armistice. Due to the post war draw down, McKinley's appointment as captain was vacated and he was made a 2nd lieutenant in the Army Air Service on September 21, 1920 (to rank from July 1, 1920). He was promoted to 1st lieutenant on April 12, 1921. On April 3, 1926, McKinley resigned from the Army to begin an aerial surveying and photography service. In 1928–1929, he was a photographer for the Byrd Antarctic Expedition. He was one of four men aboard the first aircraft to fly over the South Pole on November 29, 1929. He was decorated with the Distinguished Flying Cross by Secretary of War Patrick J. Hurley on July 9, 1930. In 1941, as the United States prepared to enter the Second World War, McKinley rejoined the Army Air Corps as a major. He was in charge of the cold-weather operations of the Army Air Force at Ladd Field in Fairbanks, Alaska. McKinley was the first person to suggest that U.S. aircraft be constructed to operate in subzero temperatures and that the Air Force should build a facility to test aircraft in subzero temperatures. He was transferred to Eglin Field for the construction of the facility. He had risen to the rank of colonel by the war's end in 1945. McKinley transferred from the Army to the newly created United States Air Force in 1947. He served in Korea in 1951 during the Korean War with the rank of colonel. After retiring from the Air Force as a colonel on June 30, 1956, McKinley worked as a civilian consultant to Admiral Richard Byrd. In 1959 he became a member of the Florida Society of the Sons of the American Revolution. Colonel McKinley died in Florida and is buried in Arlington National Cemetery. In June 1971, the McKinley Climatic Laboratory at Eglin Air Force Base was named in his honor. ^ a b c d e "McKinley Climatic Laboratory, Eglin Air Force Base, Florida" (PDF). McKinley Climatic Laboratory brochure. ASME. Archived from the original (PDF) on 2009-08-16. Retrieved 2009-01-06. ^ Official Army Register, January 1, 1926. pg. 389. ^ "Secretary of War Patrick J. Hurley presenting decorations to two Reserve officers and one enlisted man who were members of the Byrd South Pole Expedition. Sgt. Benjamin Roth, who received the Soldiers' Medal, Lieut. Dean C. Smith and Capt. Ashley C. McKinley, who received the Distinguished Flying Cross, Patrick J. Hurley and Maj. Gen. James E. Fechet, Chief of the Army Air Corps". Photograph. Library of Congress. Retrieved 2009-01-17. ^ Membership application. Florida Society of the Sons of the American Revolution. February 27, 1959. ^ "McKinley Climatic Laboratory". Landmarks. American Society of Mechanical Engineers. Archived from the original on 1 January 2009. Retrieved 2009-01-06. ^ "Hall of Valor". valor.militarytimes.com. Retrieved 2 July 2017. Eglin Air Force Base (AFB) is a United States Air Force base in western Florida, located about three miles (5 km) southwest of Valparaiso in Okaloosa County. 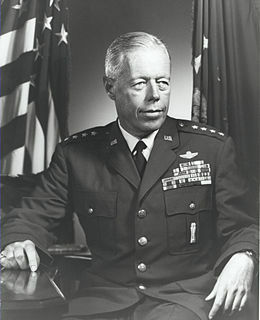 General John Charles Meyer was an American World War II flying ace, and later the commander-in-chief of the Strategic Air Command (SAC) and director of the Joint Strategic Target Planning Staff at Offutt Air Force Base, Nebraska. SAC was the United States' major nuclear deterrent force with bombers, tankers and reconnaissance aircraft, and intercontinental ballistic missiles. The Joint Strategic Target Planning Staff coordinated the nation's nuclear war plans and developed the Single Integrated Operations Plan. Floyd Bennett was an American aviator who claimed, along with Richard E. Byrd, to have made the first flight to the North Pole in 1926. However, their claim to have reached the pole is disputed. Eric Allen Boe is a United States Air Force fighter pilot Colonel, test pilot, a Civil Air Patrol member, and a NASA astronaut. He flew as the pilot of Space Shuttle missions STS-126 and STS-133. John Lucian Smith is an American Medal of Honor recipient and Marine Corps flying ace who, as Commanding Officer of VMF-223, shot down 19 Japanese planes in World War II and led his squadron to a destroy a total of 83 enemy aircraft during the Solomon Islands campaign. Laurence McKinley Gould was an American geologist, educator, and polar explorer. He made expeditions to both the Arctic and Antarctic, and was chief scientist on Richard Evelyn Byrd's first Antarctic expedition, which Gould described in his 1931 book Cold: the Record of an Antarctic Sledge Journey. He served as president of Carleton College from 1945 to 1962, and president of the American Association for the Advancement of Science in 1964. His namesakes include the research vessel Laurence M. Gould as well as Antarctic features including Gould Bay, Gould Coast, and Mount Gould. Kevin Anthony Ford is a retired United States Air Force Colonel and a NASA astronaut. Ford has received a number of special honors and awards, some of which are the Air Force Meritorious Service Medal, Air Force Commendation Medal, Aerial Achievement Medal and the Armed Forces Expeditionary Medal. Ford has also logged more than 5,000 flying hours and also holds FAA commercial certificates for airplanes, helicopters and gliders. Ford has served in many roles at NASA since his selection in July 2000. The roles include as a Capsule Communicator or CAPCOM. He was also the Director Of Operations at the Gagarin Cosmonaut Training Center in Star City, Russia from January 2004 to January 2005. He was pilot of STS-128 and Flight Engineer 2 of Soyuz TMA-06M from October 23, 2012 to March 16, 2013. Lowell Herbert Smith was a pioneer American airman who piloted the first airplane to receive a complete mid-air refueling on June 27, 1923, and later set an endurance record of 37 hours on August 28, both in a De Havilland DH-4B. Smith also piloted the Douglas World Cruiser Chicago, which along with one other made the first aerial circumnavigation in 1924. Smith held 16 records for military aircraft in speed, endurance and distance. He was awarded the best achievement in flight Mackay Trophy twice. Frederick Irving Eglin was a career officer in the United States Army Air Service and United States Army Air Corps. He was killed in an air crash on January 1, 1937, and Eglin Field, Florida, was named in his honor on August 4, 1937. Dean Cullom Smith was a pioneer American mail pilot, test pilot, flying instructor, Antarctic pilot, and airline pilot. At 17 years of age, he became the youngest flight instructor in U.S. Army history. He was a lead pilot for the U.S. Postal Service's airmail service, and was the first pilot to initiate night air mail flights. He was an executive for many airlines and aircraft companies. Clayton Charles Jerome was an aviator who served in the United States Marine Corps from to 1922 to 1952. He distinguished himself in combat during World War II and the Korean War, earning the Distinguished Service Medal and four awards of the Legion of Merit with Combat 'V' — for his valor during World War II, he received two Legion of Merit awards from the Marine Corps and one from the Army. He received his fourth Legion of Merit and the Distinguished Service Medal from the Air Force for his actions during the Korean War.